A photo from our second cruise onboard the Winifred. We are all booked for our February escape from the frigid western Pennsylvania winter. We are once again headed south to Saint Thomas. We might have mentioned that we are staying once again at the resurrected Villa Olga, now Olga’s Fancy. We both really wanted to spend some time out on the water. You also know that I’m a sucker for boats; I love sailing. We own a sailboat and are rebuilding it in the hopes of running away into a new horizon one day. 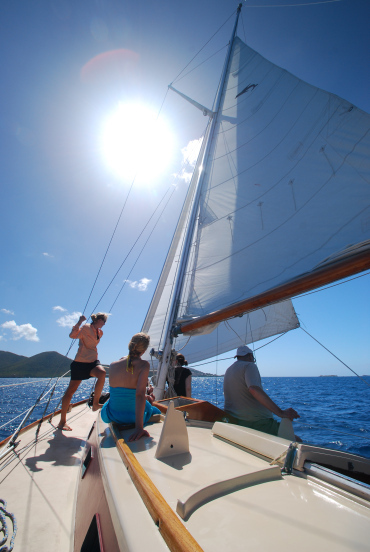 The first time we ventured to Saint Thomas we were fortunate to find a lovely 40’ wooden sailing ship named Winifred. We had a wonderful time sailing across the blue-green water of the Caribbean and swimming off the coast of Saint John. Amanda and I had such a wonderful time we searched out Winifred the second time we ventured to Saint Thomas and though she was sailing under a different owner the nice little ship gave us a nice relaxing adventure. So, of course we decided to book a tour with Winifred for our return to our favorite Caribbean island. I searched and searched and couldn’t find our favorite vessel. We were disappointed to say the least. But, as we dealt with the disappointment when our favorite hotel in Florence was booked by then finding our wonderful apartment, we decided to look for other day sail options. We looked and compared various trips and settled on Morningstar Charters. They had some nice looking boat photos on their website. I sent them an email and asked for some information on their trips, mentioning our experiences on Winifred. Imagine our surprise when we heard that they now own Winifred and that she will be the vessel we take out for our day sail! I couldn’t believe that out of all of the charters the one that we requested information from was the one Winifred now calls home. The itinerary is a little different now; we have to take a ferry to Saint John and meet the ship there. We get to order from a large deli menu for our picnic lunch and will have time to look around Saint John when we are done with the sail, all things we are looking forward to. We are counting down the days until our escape. We’ve been keeping track and reminding each other each morning. I can’t wait. I’m glad we were able to help out. The new owners are wonderful and have put a lot of money in the the boat. I think they still have a long way to go to completely restore her to her former glory but they seem very capable.